We have been going buggy in Kindergarten this week! Our main focus has been on ants and bees...I will post some goodies soon! 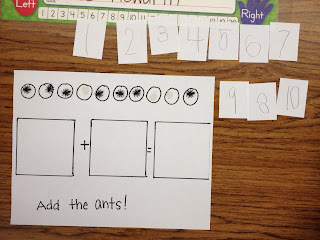 I wanted to share a fun and simple addition activity that I did with my students. It was hands-on and involved our insect theme too! I quickly, drew a mat that the students could make addition sentences on using little toy ants. (some are white and hard to see..) I bought them at the Dollar Store around Halloween and we have been using them for various math things all year. 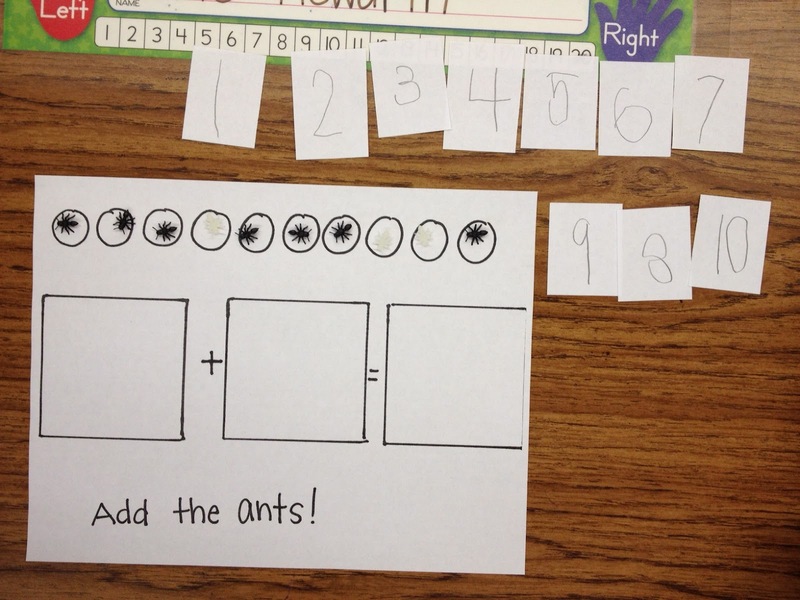 Student A would place ants in the first two boxes to make an addition sentence ___+___. Student B would then solve the addition problem and place the number card in the last square. They took turns putting the ants in the box and then solving the problem. They really enjoyed this and were focused for about 15 minutes! This gave me time to float the room and make sure they were understanding the concept of addition! LOVE this! So perfect for the lil guys! I bet they loved the ants and had them crawling everywhere. Such a cute idea, Michelle! Cute Cute Cute!!! We're doing bugs in two weeks! Thanks for sharing! Looks like FUN! Cute...we are wrapping up The Very Hungry Caterpillar and heading into bugs. PERFECT timing!! Oooooh love this! Where did you buy your ants?